Al Kazeem rewarded the patience of his owner John Deer and trainer Roger Charlton by coming through to cut down the front-running Mukhadram close home to score by a neck in the Group One Prince Of Wales’s Stakes. The victory gave his jockey James Doyle a first Royal Ascot success. The rider said: “I was only worried for a second, when we turned in. I thought that Paul Hanagan gave his horse a fantastic ride – he got the fractions right, filled his up at the right time and quickened off the turn. “We settled into a nice rhythm but Mukhadram got a couple of lengths on me turning in and I had to make them up. I could see Paul just getting away from me on the turn and had a bit of work to do but you have to believe in your horse – I have done nothing but win on this fellow. My confidence with him is amazing. 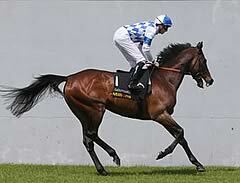 “Al Kazeem digs deep and is such a hardy, tough horse. He loves to get in a battle and he showed what a good horse he is by quickening up. I am very lucky to be sat on him. “He is a class act over a mile and a quarter and arguably even better over a mile and a half. But a mile and a quarter is no problem – he has the tactical speed, quickened and picked up. He is a serious horse over a mile and a quarter. “It’s magical, really – to get a Royal Ascot winner. It leaves you speechless in some ways but this is what it is all about. All of those mornings, working hard, going to all of the evening meetings and all of the hard work that you put in. It does pay and it’s great when it does. Roger Charlton, celebrating his biggest success at Royal Ascot with his eighth winner, said: “The name of the game is patience. Sir Henry Cecil said “patience, patience and more patience” and you need the owners to do that. We always thought we had a really good horse, so it was worth waiting for. “To be fair, we nearly ran him in the autumn (last year) and then decided to give him more time. You can’t do it without the horse and, as we saw today, he is a very tough, very genuine horse. I thought for an awful minute that we weren’t going to get there but James seemed quite confident, so how do I know anything? I thought James gave him a great ride. For a young guy who hasn’t ridden that many good horses, I am so pleased for James. We have asked him big questions and he has delivered. He is going to go forwards. “The horse really answers the demands and he kept staying on all the way to the line. Obviously, it is very thrilling. It would have been horrible to just miss out with all due to respect to William Haggas’s horse. It would have been awful to be in front a stride past the line. It is always nerve-wracking – I am never complacent. You never take anything for granted until they are past the line. “His owner breeder was offered lots of money for this horse and often people accept those offers so I am lucky to have the horse really.He is a very special horse. He is a very good-looking horse – he has got that lovely Dubawi head and he clearly stays a mile and a half well and he has all the attributes that make a good horse. “He has a fantastic temperament and, apart from the pelvis, has been fantastically sound and he is a real trier. I think that there are lots of lovely races for Al Kazeem. I don’t know without discussing it with the owner but I have always longed to have a runner in the Arc – I think he is a horse who is very happy if the ground is on the soft side and he has proved that he probably needs a mile and a half. That would be his end of season target and very exciting to go for. Al Khazeem is a 5/1 chance from 6/1 for the King George VI & Queen Elizabeth Stakes Sponsored by Betfair with Betfair. Former champion jockey Paul Hanagan produced an audacious ride that almost pulled off a surprise win. Riding Mukhadram for Sheikh Hamdan Al Maktoum and trainer William Haggas, Hanagan made the running and then kicked clear on the home turn. His four-year-old partner produced a sustained burst for the line that held off all rivals bar one, Al Kazeem, who wore him down to win by a neck. Three and a quarter lengths further back was The Fugue. Betfair, sponsors of the King George VI & Queen Elizabeth Stakes at Ascot on July 27, cut Mukhadram from 33/1 to 10/1 for that race after his fine effort. The Fugue was running for the first time since November’s Breeders’ Cup. 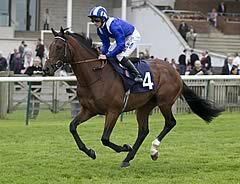 Her trainer, John Gosden said: “She ran a super race and finished very strongly, so I’m delighted with her. The first two set a very high standard and he [Hanagan] did a very good job. Last year’s dual Epsom and Irish Derby winner Camelot, who had a colic operation in October last year, could fare no better than fourth place. 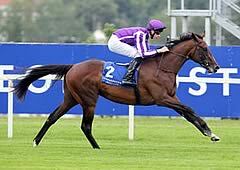 Trainer Aidan O’Brien said of the 5/2 favourite: “We will wait and see what happens next. He had a tough enough winter – they will tell you (surgeons) that a big operation will take at least four months for the wound to heal. “I have never really chased him (at home) – we have been letting the racing bring him on but maybe it is time to chase him we have to be very conscious of what he has been through. The runs have been bringing him on but maybe he is at the stage where he should be chased after a little bit. “There are a lot of options open to him – races like the Coral Eclipse and all those races.